Click here for the printable pdf of these talking points. The North Carolina Department of Transportation (NCDOT) wants to hear from you regarding its plans to widen Merrimon Ave from King Street to a little past Edgewood Road. NCDOT’s proposed design can be found here. The NCDOT announcement can be found here. The primary intent is to add a center turn lane to accommodate automobile traffic. 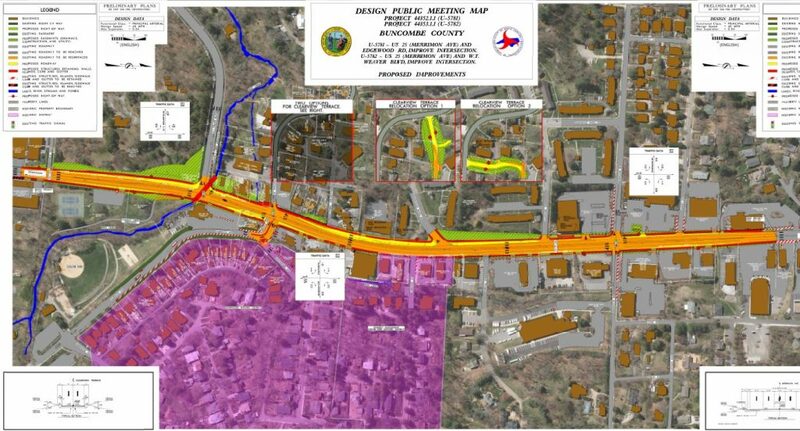 NCDOT’s public comment meeting was held Monday January 8th from 4-7pm at North Asheville Recreation Center, 37 E. Larchmont Rd. This was a drop in session and the general public was invited to attend anytime between the hours of 4pm – 7pm. Asheville on Bikes position is that it is critical that redesigned streets advance safety and active transportation. Please attended public meetings and asked questions about this project. We published this post a few days before the Jan 8th meeting and we encourage people print out our list of questions for their own use. Did NCDOT consult with the City of Asheville before these current plans were released to the public? When was the City consulted? What was the City’s feedback? What steps did NCDOT take to incorporate existing city plans into the Merrimon widening project? 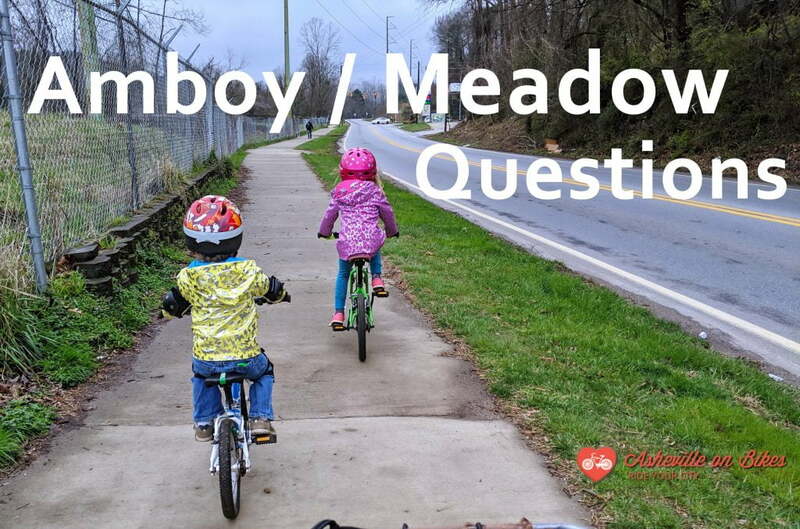 For instance, the City of Asheville’s Bicycle Comprehensive plan, which was funded by NCDOT, calls for the inclusion of climbing lanes in this project area but climbing lanes are not included in the proposed design. Why not? 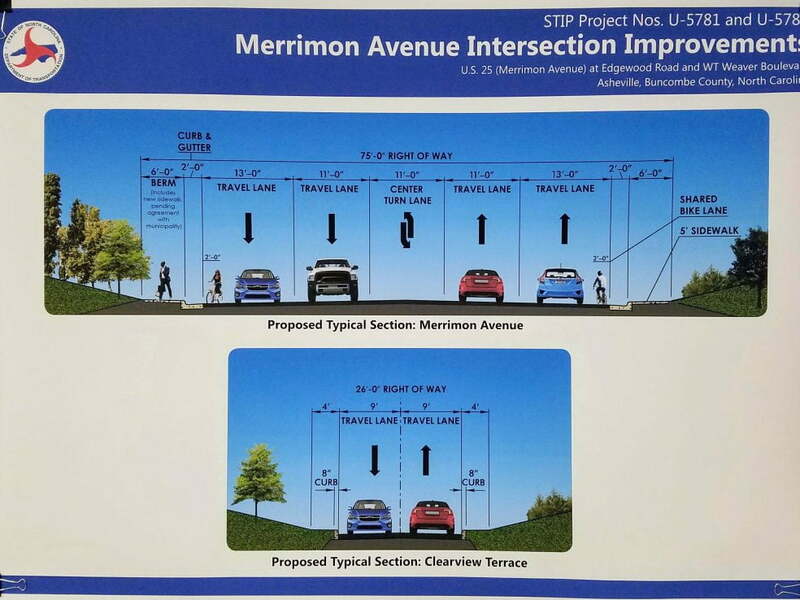 How will the proposed widening of Merrimon Avenue improve safety for all users and help to meet NCDOT’s safety performance measures? The NCDOT Complete Street Policy instructs NCDOT to incorporate all modes of transportation when constructing new projects or making improvements. Why does this project not incorporate bicycle infrastructure? What is the required public notice period and how was it met for this proposal? What is the purpose of the 13-ft wide outside lane? How was pedestrian and bicyclist LOS evaluated? What methodology was used? Where is the evaluation published? Will you send me a copy? Will refuge islands be included at signalized intersections to provide pedestrian safety? How does the proposed design improve the greenway connection crossing Merrimon Avenue and does the design comply with federal transportation standards? Please provide the standard that is being applied. Are flashing yellow turn lights planned for this project? How will the proposed intersection signal timing for pedestrians promote safe crossings? What is the crash history along this section of Merrimon Avenue? Why was a design speed of 40 MPH selected for this proposal? How will the proposed design improve safety for all users? What elements in the proposed design will support safer streets that align with NCDOT’s commitment to Vision Zero? Understanding that a recent pedestrian fatality occurred less than 200 feet south of the project area, how do the proposed improvements address pedestrian safety?